This miso soup is without tofu or spring onions – two fresh ingredients that I don’t always have at home. 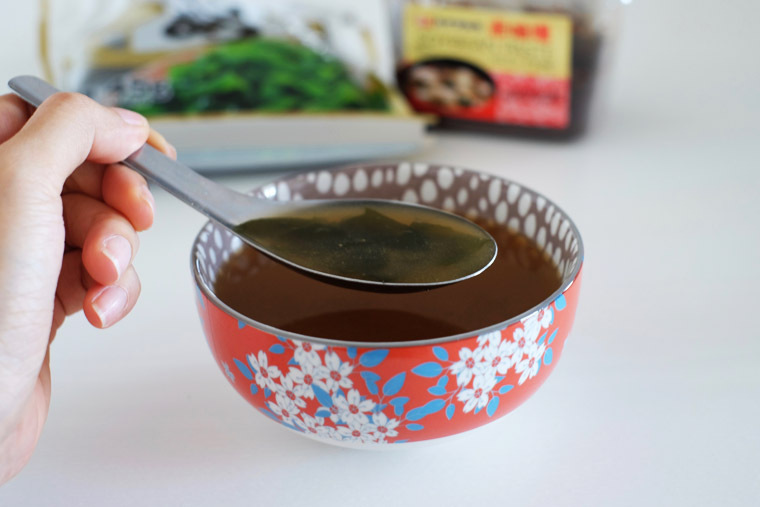 It’s made with three basic ingredients – homemade dashi stock, miso paste and wakame. You could use dashi granules, but I always like to make my own stock. Understandably, in a typical Malaysian kitchen, we may not have dashi stock. But its really easy and convenient to make – you only need to boil kelp and bonito flakes, and both are dried ingredients that have long shelf life. I always make a huge batch ahead and keep it in the fridge. 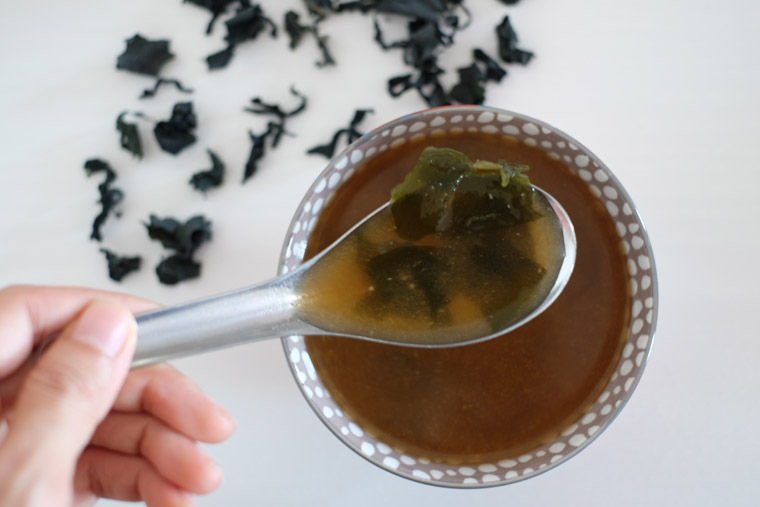 First you need to make dashi stock with kelp and bonito flakes (find out how to make dashi stock here.) Then, its a matter of adding miso and soaked wakame into the stock. If you have other ingredients like tofu, radish, or spring onions; you could add it into your soup. You could also get pre-made stock off the shelf (though I don’t). Step 1 SOAK WAKAME: Soak dried wakame for 5 minutes. It will expand. Step 2 SIMMER DASHI: Pour homemade dashi into the pot. Turn on medium heat and simmer until its hot. Turn off the heat. Step 3 DISSOLVE MISO: Add 1 tbsp of miso into the pot. Alternatively, for a smoother texture, put miso in a bowl and add a tablespoon of dashi. Mix well before pouring into the pot of dashi. Step 4 ADD WAKAME: Add soaked wakame and serve. Heat 1 cup of dashi stock. Dissolve 1 tbsp of miso paste into stock. Add soaked wakame. Soaking wakame is optional At a cooking class in Tokyo, I asked why we must soak the wakame. I normally just chuck the dried seaweed in. My cooking instructor told me she does the same at home. Soaking wakame in cold water just gives it a better colour. Get store-bought dashi stock. When I was staying with my host family in Japan, I see that they keep bottled dashi stock in the fridge. If you can’t make your own dashi stock, you can try those. However, it is not commonly found in Malaysia. I only found one ‘Ninben Shiro Dashi’ at Happy Fresh, an online grocer. It cost about RM 24 per 500 ml.